DH Farm Machinery is a well established farm machinery sales, service, tractor parts and agricultural spare parts business based in Gort, Co. Galway. Since opening in 2001, DH Farm Machinery has built up a considerable customer base supplying both farmers and contractors all over Ireland. DH Farm Machinery holds several agencies, some of which are: Mandam, SMS, Femac, Humus, Conor, Malone, Bogballe and Bredal. In May 2014 DH Farm machinery opened Ireland's first and leading tractor and farm machinery online agri parts website www.dhfarmmachinery.com. Over 30,000 parts can be ordered from the comfort of your own home, with a quick efficient delivery service available. 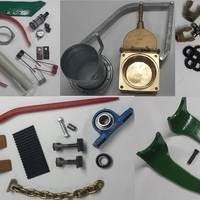 We stock tractor parts such as John Deere parts, Massey Ferguson parts, Ford New Holland parts, David Brown parts, Case parts, IHC parts, Fiat parts, Deutz parts, Fendt parts, JCB parts, Kubota parts, Lamborghini parts, Landini Parts, McCormick parts, Nuffield parts, Renault parts, Claas parts, Same parts, Zetor parts, Steyr parts, Valtra parts and many more tractor parts. We are also the only importer in Ireland of Mandam equipment which includes disc harrows, chain harrows, and ring roller and pan mixers. At DH Farm Machinery value and service to the customer means everything to us and we are constantly trying to ensure every item we sell is very competitively priced and the customer is happy with the service we offer. So remember for all your agricultural farm machinery and tractor spare parts www.dhfarmmachinery.com is the best place to go.